For cyclists who are looking for endurance, bead-to-bead protection and long life from their tyre. The Pro4 Endurance tyre (700 x 23c or 25c) offers you all-round protection, lower rolling resistance and superior wear and tear with excellent grip. Technical solutions: - Specific bi compounds tread, developed to ensure an unbelievable wear resistance, and yet grip on the angle. Combination of the reliable 110 TPI carcass fabric, and bead-to-bead breaker ensure a great resistance to road hazards and also from cuts and wear. The HD Protection Bead2Bead technology consists of a High Density crossed fibre reinforcement which protects the full casing of the tyre. The crown as well as the sidewall of the tyre are strengthened to assure maximum of protection and longevity. 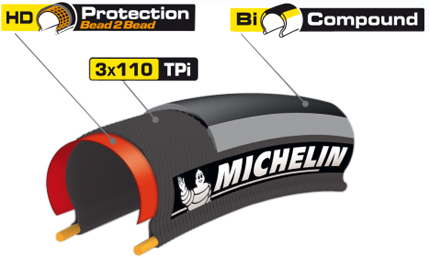 Michelin tyres benefiting from the technology HD Protection Bead2Bead are particularly adapted to demanding cyclist that is in search of the best compromise in puncture protection, longevity and weight. The Technology Bi-compound, has two different rubber compounds within the tread area. The rubber compound in the centre of the tread assures the optimal transmission of torque, that traction when pedaling or when braking. These rubber compounds are designed and optimised to increase resistance to wear, but also help braking safely on wet ground. The rubber compound at the shoulder area of the tread brings maximum performance and safety when leaning into a curve or turn giving exceptional levels of grip on dry as well as wet surfaces. Technology Bi-Compound was invented in 1995 and Michelin R&D continues to improve year after year the performance of this rubber compound and proposes them in many road tyres giving the benefit of this technology, for maximum of grip and resistance to wear for the demanding cyclist. Michelin Pro4 Endurance V2 Folding Tyre is rated 4.4 out of 5 by 122. Rated 5 out of 5 by LincolnWill from A great all rounder I started using these tyres on my commuter about 12 months ago and haven’t looked back. I found that whilst gatorskins offer fantastic puncture protection, they’re too hard and slow on a long commute. These offer a decent level of puncture protection, good rolling resistance and look good with various colour options on the walls if you want to try and match to your frame etc. They do inflate wider than indicated and the 25mm inflated to approximately 28mm but that’s fine by me! Rated 2 out of 5 by tinaciclista from Hard to put on and split along the color edge I have used these for years, but no more. Two in a row that developed a deep split on one/both sides, where the color joins the center compound. To be fair this happened after about 3-4000km. Rated 4 out of 5 by dvonrick from Good tire good service Good tire at a good price from a vendor with good service. Rated 5 out of 5 by MD01 from Good value Have used these tyres for the past couple of years average 7000 miles a year and these tyres offer excellent mileage usually a couple of pairs a year. Fairly light roll very nicely reasonable puncture resistance. What does the V2 refer to? As per the question, what does the V2 refer to that can justify the high asking price for this tyre? I was looking for the normal, cheaper version of the pro4 endurance but I came across this one. I've got these on my winter bike and love them, but are they suitable for summer use on the 'good' bike? Up to 100 milers in warmer weather? Any experiences appreciated. How wide and tall do the 25mm versions come up on old-skool 15mm, and new-fangled 18mm internal rims? The profile of the tyre will vary depending on the width of the rim it is fitted to. The tyre will sit slightly taller on narrower rims. Unfortunately these tyres are not tubeless compatible I'm afraid. I looked on the Michelin website, and can't see a V2 mentioned anywhere. What is the difference between the V2, and the tyre without V2 in the name which is selling for approx. half the price? V2 will be Version 2 of the Pro4 Endurance tyre. The updated design has developed the wider, shorter contact patch, creating less carcass deflection, reducing rolling resistance. The tyre is made with a 3x110 TPI casing with a bead-to-bead breaker providing 40% greater puncture resistance than its nearest rival in Michelin&rsquo;s own tests. I ordered Michelin Pro4 Endurance V2 , but when I opened my parcel I found the package of Michelin pro4 Endurance without V2 , I didn't found V2 written nether on the package nor on the tyre, how did I know that the tyres I ordered is V2 or it isn't? is the price for a set of two tyres? The tyres are sold individually.